The grandeur of this brand new luxurious Adirondack Lodge compliments its picturesque setting overlooking the Sentinel Mountain range. The dramatic great room is highlighted by a wall of windows, cathedral ceiling, stone fireplace, hardwood floors, with an adjacent gourmet kitchen. This stylistic floor plan over two levels with five bedrooms and 3.5 full baths, with the master suite situated on the main level apart from the other bedrooms thus offering maximum privacy. 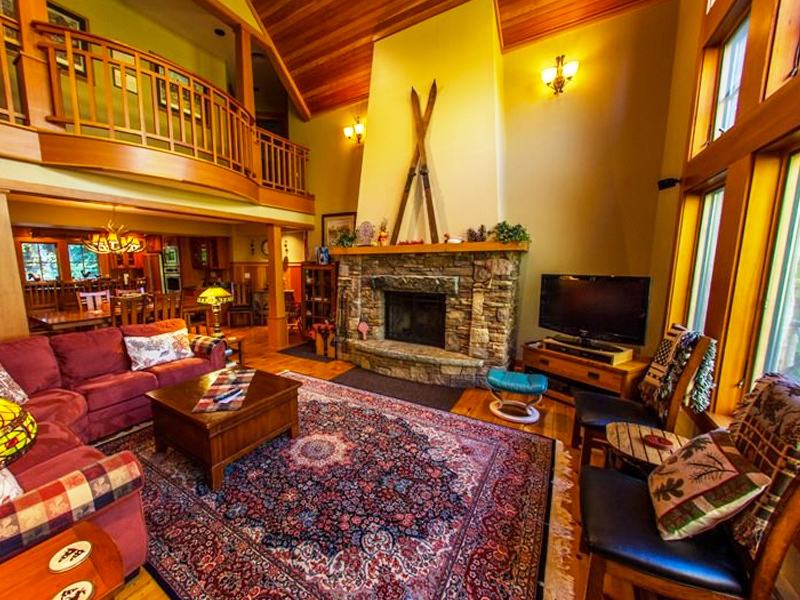 Furnishing are “stickly” offering a truly Adirondack experience. Recreational alternatives include access to a private beach on Mirror Lake. The “Wilderness Lodge” is nestled among pine trees, conveniently located within walking distance to the village proper, and is truly the essence of a mountain retreat. The master suite has a king sized bed on the main level, private full bath, the second floor has 3 additional bedrooms with 2 queen sized beds and 2 twin sized beds, 2 full baths. The fifth bedroom has four twin sized beds. The TV area a queen sized sleeper sofa. There are plasma HD TV’s in each bedroom, a 52 inch in living room and TV area. There is an additional 1/2 bath on the main level, oversized attached 2 car garage.